March 25, 2013—CLEVELAND, OHIO—Great Lakes Brewing Company (GLBC) is thrilled to announce the release of Rye of the Tiger IPA. Name Origin: Our Rye of the Tiger has claws. Named for its fierce hop profile and sharp rye content, Rye of the Tiger is a thrilling India Pale Ale with bite. Rye of the Tiger is crafted for the fighter in all of us, a powerful beer meant to inspire feats of strength and skill. At 7.5%, mind those catlike reflexes if your bout goes into extra rounds. If you can handle this hopped-up kitty, you’ve earned your stripes. Flavor: Strong citrus and pine presence with a clean, dry finish. Availability: The first taste of Rye of the Tiger IPA will be available on tap exclusively at GLBC’s Ohio City Brewpub beginning Thursday, March 28 at 4PM. On Friday, March 29 at 5PM, GLBC’s Gift Shop will begin selling bottles. 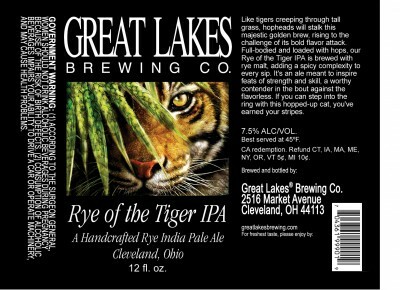 Rye of the Tiger IPA will hit GLBC’s distribution markets starting Monday, April 1. Rye of the Tiger IPA, which is brewed with a complex blend of hops and rye malt, is the second of two new Seasonals in GLBC’s 2013 lineup.